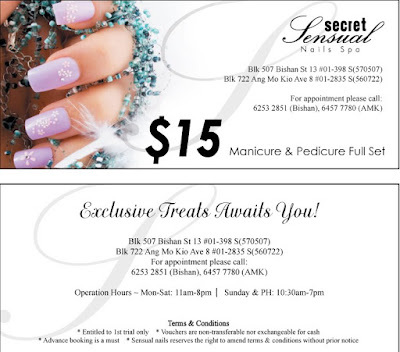 This is a voucher for Secret Sensual Nails Spa, $15 for Manicure and Pedicure only! Just print and call them to book! I was very happy with the mani-pedi that they did for me, asked them for a special deal for my customers, and they gave me these vouchers to give away! Till Dec 2009 only.